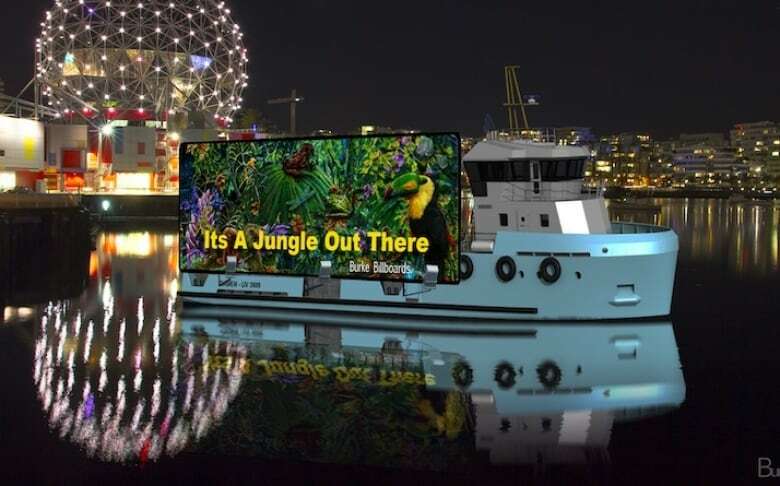 An electronic billboard is now cruising around False Creek, with a lit-up advertising display that's wider than many city lots. The boat is run by Burke Billboards, a company incorporated in B.C. 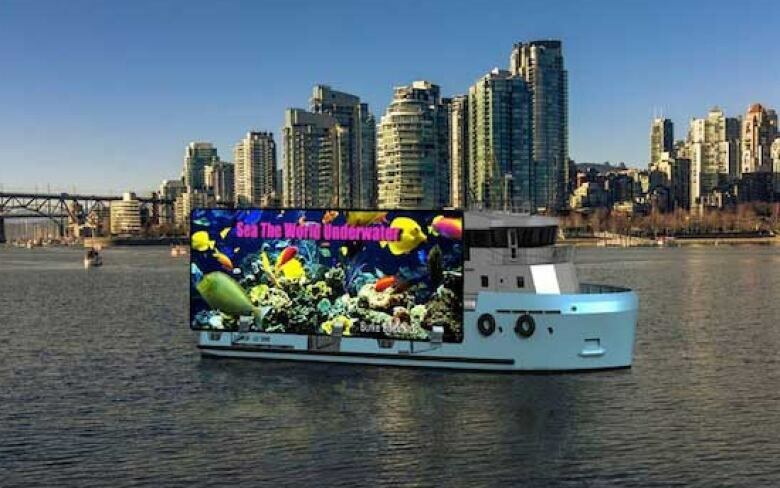 last week, and has a 12-metre wide electronic billboard that will motor past past Science World, Granville Island and the seawall from 7 a.m. to 11 p.m. PT seven days a week, according to the company's website. CEO Tara Burke declined to speak to CBC News when reached by phone, but in an emailed statement said her company would offer free advertising to local charities and arts groups, in addition to paid ads for businesses. "We take the beautiful waterways, the stunning skyline of Vancouver, and make it the perfect platform for you to grasp your audience's attention," states Burke Billboards' website. The site boasts the moving billboard will "reach a diverse market" along the urban waterway, including visibility at special events like the Dragon Boat Festival, Celebration of Lights Fireworks Festival, and Bard on the Beach Shakespeare Festival. Floating billboards are not unheard of, but have been controversial in other cities, including Seattle, Wash. where the city called them illegal a few years ago. In Vancouver, the bright display is already attracting criticism. "It's very crass," said resident Michael Levy, who enjoys walking along False Creek because of recent green space developments — like Habitat Island near the Olympic Village — and the occasional visit from whales or dolphins. "All that enhances the beauty of False Creek, it makes it one of the gems of this city, and to have this crass, offensive, commercial billboard is really bothersome." Levy said when he called the city's 311 information line, he was told there have been numerous complaints about the business, but that it didn't fall under city jurisdiction. City of Vancouver staff could not immediately tell CBC News what the rules are for floating billboards or if they're allowed. "The City is looking at its authority to act in respect to the digital sign given the jurisdiction of the federal government over navigation and shipping in False Creek and English Bay," staff said in a statement.